U.S. Pat. Nos. 6,303,790, 6,531,597, 6,297,375 and 6,479,483, 6,719,996 and 6,593,472 to Hoffmann La Roche(originator). 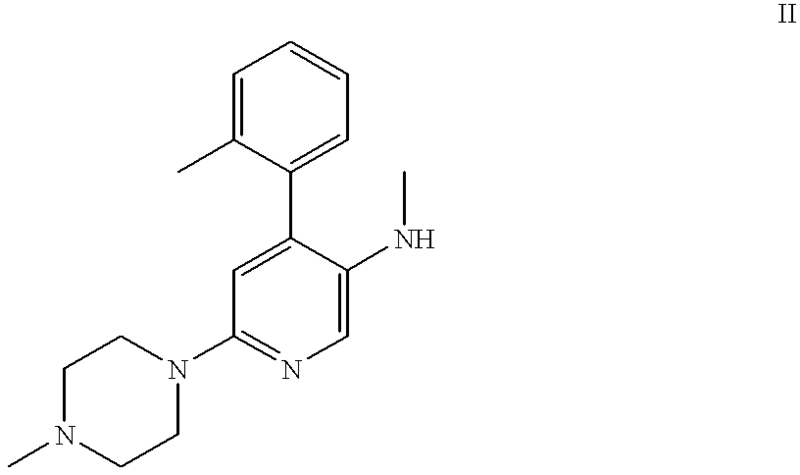 Netupitant is a tachykinin NK-1 antagonist which had been in phase III clinical trials at Helsinn for the prophylaxis of chemotherapy-induced nausea and vomiting and in phase II clinical studies for the treatment of overactive bladder. However, no recent development has been reported for this research. NK-1 receptor antagonists work by blocking the action of neurokinin-1 (Substance P), a naturally-occurring neurotransmitter in the brain that causes emesis. Netupitant was originally developed at Roche. In June 2005, Helsinn and Roche signed a licensing agreement granting Helsinn worldwide rights to the drug candidate. Methods of synthesizing and formulating netupitant and its prodrugs are described in U.S. Patent Nos. 6,297,375, 6,719,996 and 6,593,472 to Hoffmann La Roche. Netupitant is a highly selective NK1 receptor antagonist, which is thought to work by blocking the action of substance P, an endogenous neurotransmitter contained in high concentrations in the vomiting center of the brainstem that can stimulate the vomiting reflex. Netupitant is currently under phase III trials. Chemotherapy is one of the treatment options utilized by oncologists in treating different types of cancers. Nausea and vomiting are the most common side-effects experienced by cancer patients when administered with chemotherapy. Netupitant-palonosetron, which is currently in Phase III trials helps in preventing CINV. The blockage of P/NK1 receptors by Netupitant in the central nervous system inhibits the binding of endogenous tachykinin neuropeptide substance and this result in preventing the chemotherapy-induced nausea and vomiting. Moreover, Palonosetron helps in the blockage of serotonin at 5-hydroxytryptamine type 3 (5-HT3) receptors and it also helps in the chemotherapy-induced nausea and vomiting. 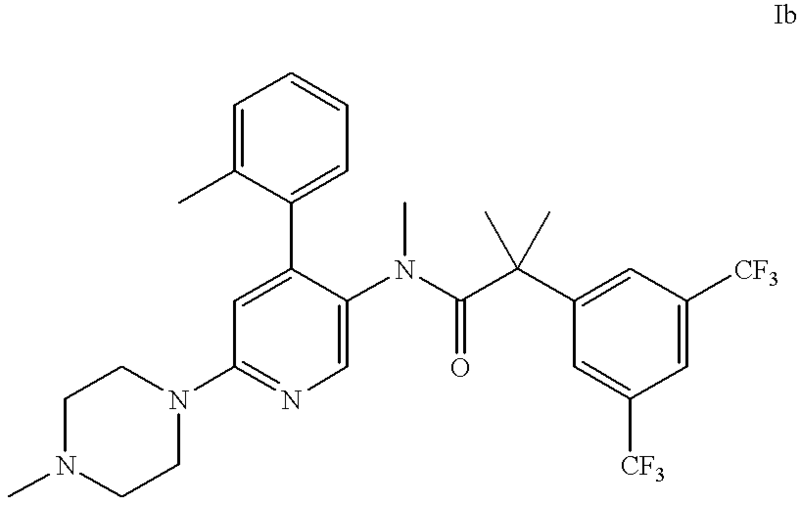 Netupitant-Palonosetron FDC is estimated to answer significant unmet needs of the CINV market post its launch that is expected to be commercialized in 2014, as it would overcome the problems associated with current treatment with 5-HT3 receptor antagonists. Similar to Emend, Netupitant-Palonosetron FDC would gain considerable patient pool after its estimated launch in 2014, and subsequently match the patient share of Aloxi by 2018. Netupitant-Palonosetron FDC sales are expected to reach an estimated USD 515.0 million USD by 2018. FDC combination of 5-HT3 receptor antagonist and neurokinin-1 (NK1) receptor antagonist have shown better efficacy results in Phase II clinical trials for CINV patients and would thus lead to high uptake due to shifting physician and patient preference pattern towards better treatment for CINV. 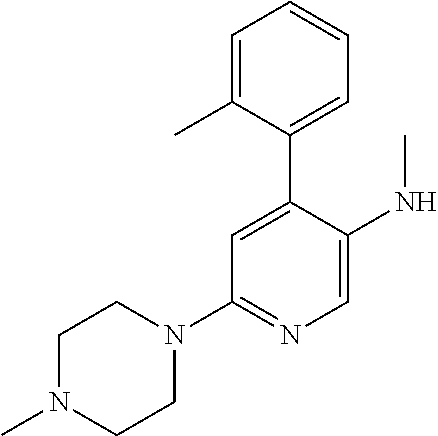 Neurokinin 1 receptor antagonists are being developed for the treatment of a number of physiological disorders associated with an excess or imbalance of tachykinin, in particular substance P. Examples of conditions in which substance P has been implicated include disorders of the central nervous system such as anxiety, depression and psychosis (WO 95/16679, WO 95/18124 and WO 95/23798). The neurokinin-1 receptor antagonists are further useful for the treatment of motion sickness and for treatment induced vomiting. The New England Journal of Medicine, Vol. 340, No. 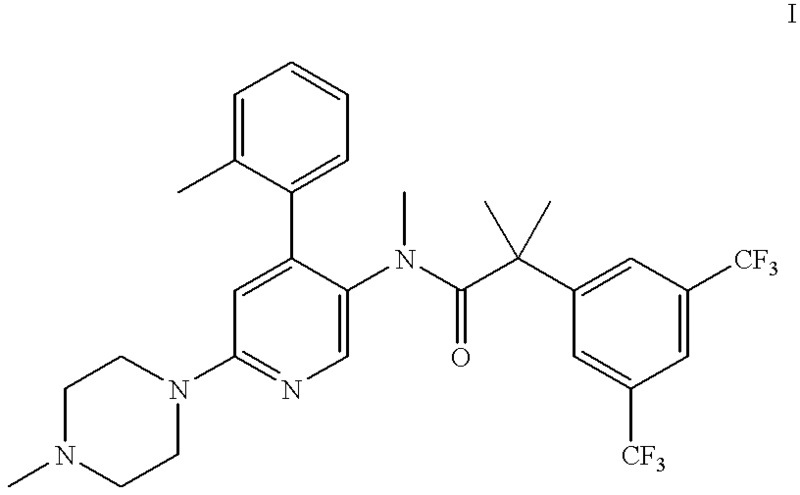 3 190-195, 1999 has been described the reduction of cisplatin-induced emesis by a selective neurokinin-l-receptor antagonist. 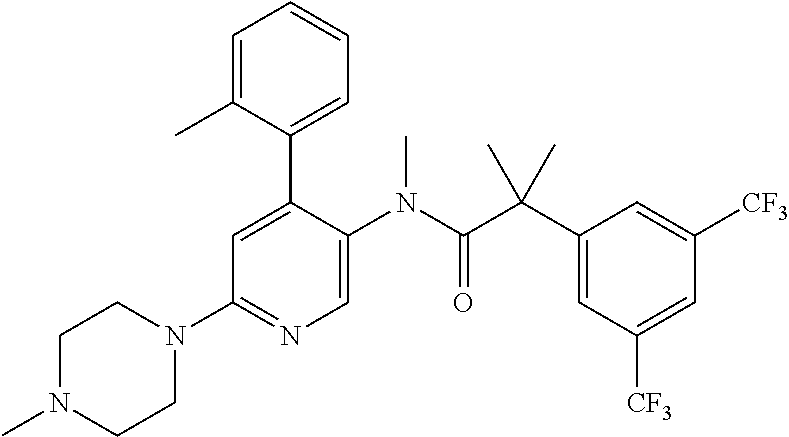 US5,972,938 describes a method for treating a psychoimmunologic or a psychosomatic disorder by administration of a tachykinin receptor, such as NK-1 receptor antagonist. GlaxoSmithKline, and palonosetron, developed by Helsinn Healthcare. Nolpitantium and SSR240600 (developed by Sanofi-Aventis), SCH388714 and Rolapitant (developed by Schering-Plough), TAK637 (developed by Takeda), HSP117 (developed by Hisamitsu), KRP103 (developed by Kyorin Pharm) and SLV317 (developed by Solvay). 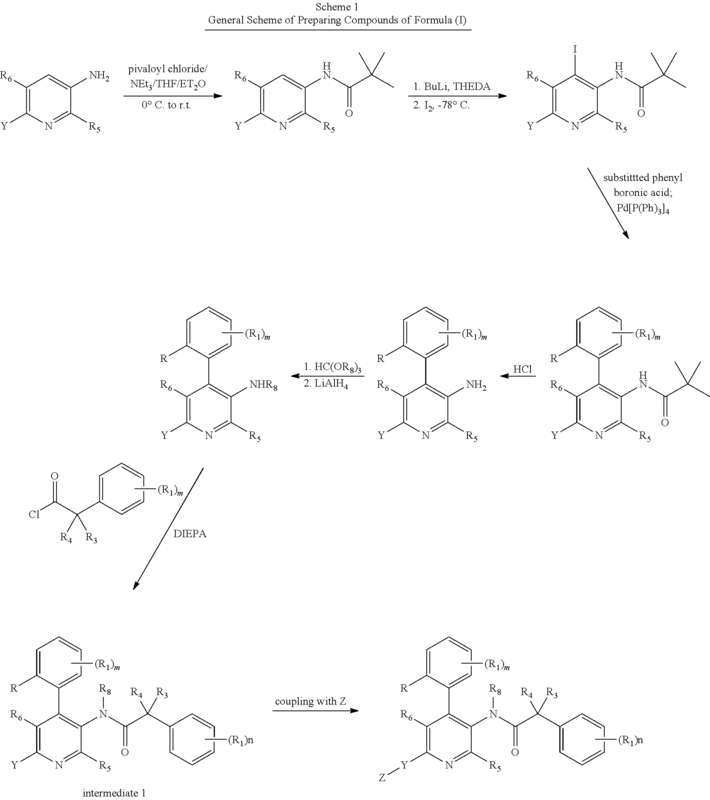 Chemical structures of the above-mentioned NKi antagonists are shown below and discussion of those compounds as well as other NKi antagonists is present in Expert Opin. Ther. Patents (2010) 20(8), pp 1019- 1045 by Huang et al. and to pharmaceutically acceptable acid addition salts thereof. To a solution of 20 g (126 mmol) of 2-chloro-5-nitropyridine in 200 ml tetrahydrofuran were added dropwise 35 ml (315 mmol) 1-methylpiperazine within 10 min. The reaction mixture was refluxed for additional 1.5 h. After cooling to room temperature, the solvent was removed in vacuo and the residue was re-dissolved in 200 ml ethyl acetate. The organic phase was washed with 200 ml 1 N sodium bicarbonate solution, dried (magnesium sulfate) and evaporated to give 27.9 g (quantitative) of the title compound as a yellow solid. MS m/e (%):223 (M+H+, 100). To a solution of 27.9 g (125.5 mmol) of 1-methyl-4-(5-nitro-pyridin-2-yl)-piperazine in 400 ml methanol were added 2.6 g of 10% of palladium on activated charcoal. The reaction mixture was hydrogenated (room temperature to ca. 45° C., 1 bar) until the theoretical amount of hydrogen was taken up (about 2 h). The catalyst was filtered off and was washed twice with 100 ml portions of methanol. The filtrate was evaporated in vacuo to give 28 g of a purple oil which consisted to ca. 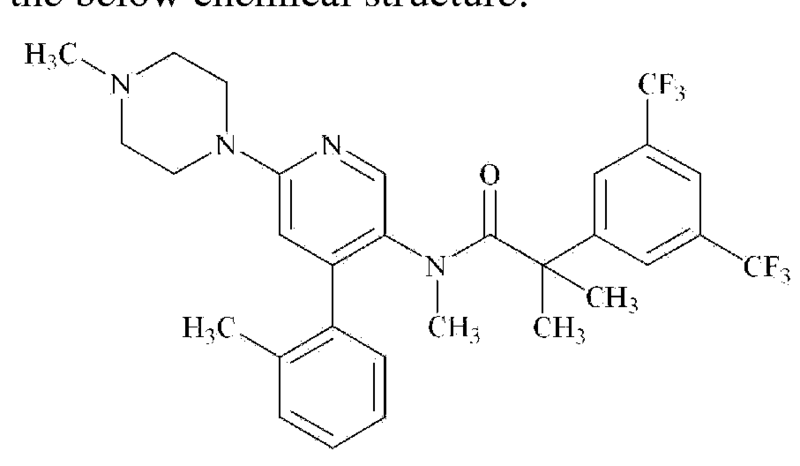 90% of the desired aniline derivative according to analysis by thin layer chromatography. This crude product was dissolved in a mixture of 400 ml tetrahydrofuran and 100 ml diethyl ether. After cooling to 0° C., 30 ml (215 mmol) of triethylamine were added in one portion. Stirring was continued while 26 g (215 mmol) of pivaloyl chloride were added dropwise within a period of 10 min. The ice bath was removed and the reaction mixture was stirred for 1 h at room temperature. Then, the solvent was removed in vacuo and the residue was suspended in 200 ml 1 N sodium bicarbonate solution. The product was extracted three times with 200 ml portions of dichloromethane, dried (sodium sulfate) and purified by flash chromatography to give 30 g (86%) of the title compound as pink crystals. MS m/e (%):277 (M+H+, 100). A solution of 30 g (108 mmol) 2,2-dimethyl-N-[6-(4-methyl-piperazin-1-yl)-pyridin-3-yl]-propionamide and 58 ml (380 mmol) N,N,N′,N′-tetramethylethylenediamine under argon in 650 ml tetrahydrofuran was cooled in a dry ice bath to −78° C. Within lh, 239 ml (380 mmol) of a 1.6 N n-butyllithium solution in hexane were added dropwise. The reaction mixture was allowed to warm up to −30° C. overnight. After cooling again to −78° C., 43.6 g (170 mmol) iodine dissolved in 60 ml tetrahydrofuran were added dropwise during 15 min. The dry ice bath was replaced by an ice bath and a solution of 90 g (363 mmol) sodium thiosulfate pentahydrate in 250 ml water were added within 10 min when the temperature of the reaction mixture had reached 0° C. Then, 1000 ml diethyl ether were added and the organic layer was separated. The aqueous layer was extracted twice with 500 ml dichloromethane and the combined organic layers were dried (magnesium sulfate) and evaporated. Flash chromatography gave 18.5 g (42%) of the title compound as a light brown oil which crystallized upon standing at room temperature. MS m/e (%): 403 (M+H+, 100). A mixture of 54 g (134 mmol) N-[4-iodo-6-(4-methyl-piperazin-1-yl)-pyridin-3-yl]-2,2-dimethyl-propionamide, 420 ml toluene, 150 ml 2 N sodium carbonate solution, 4.63 g (3.9 mmol) tetrakis(triphenylphosphine)palladium(0) and 20.16 g (147 mmol) o-tolylboronic acid was heated under argon at 80° C. for 12 h. After cooling to room temperature, the aqueous phase was separated and washed twice with toluene. The combined organic layers were washed with 50 ml brine, dried (sodium sulfate), evaporated and dried in vacuo to yield 49 g (quantitative) of the title compound as a brown oil. MS m/e (%): 367 (M+H+, 100). A suspension of 56 g (152 mmol) 2,2-dimethyl-N-[6-(4-methyl-piperazin-1-yl)-4-o-tolyl-pyridin-3-yl]-propionamide in 1300 ml 3 N hydrochloric acid solution was heated to 90-95° C. overnight. The reaction mixture was cooled to room temperature, washed with three 500 ml portions diethyl ether and filtered over celite. The filtrate was diluted with 500 ml water and was adjusted to pH 7-8 by addition of 28% sodium hydroxide solution under ice cooling. The product was extracted with four 1000 ml portions of dichloromethane. The combined organic layers were washed with 500 ml brine, dried (magnesium sulfate) and evaporated to give 35 g (82%) of the title compound as a light brown oil. MS m/e (%):283 (M+H+, 100). A solution of 35 g (124 mmol) 6-(4-methyl-piperazin-1-yl)-4-o-tolyl-pyridin-3-ylamine in 270 ml trimethyl orthoformate and 8 drops trifluoroacetic acid was heated for 3 h at 130° C. The reaction mixture was evaporated and dried in vacuo for 30 min. The residual oil was dissolved in 100 ml tetrahydrofuran and was added dropwise under ice cooling to 9.4 g (248 mmol) lithium aluminum hydride in 300 ml tetrahydrofuran. The reaction mixture was stirred for lh at room temperature, cooled to 0° C. again and acidified (pH 1-2) by addition of 28% hydrochloric acid solution. After stirring for 5 min, 28% sodium hydroxide solution was added to reach pH 10. The solution was filtered over celite, evaporated and purified by flash chromatography to give 23.6 g (64%) of the title compound as a light brown oil. MS m/e (%):297 (M+H+, 100). A solution of 20 g (67.5 mmol) methyl-[6-(4-methyl-piperazin-1-yl)-4-o-tolyl-pyridin-3-yl]-amine and 17.5 ml (101 mmol) N-ethyldiisopropylamine in 200 ml dichloromethane was cooled in an ice bath and a solution of 24 g (75 mmol)2-(3,5-bis-trifluoromethyl-phenyl)-2-methyl-propionyl chloride in 50 ml dichloromethane was added dropwise. The reaction mixture was warmed to 35-40° C. for 3 h, cooled to room temperature again and was stirred with 250 ml saturated sodium bicarbonate solution. The organic layer was separated and the aqueous phase was extracted with dichloromethane. The combined organic layers were dried (magnesium sulfate) and evaporated. The residue was purified by flash chromatography to give 31.6 g (81%) of the title compound as white crystals. M.p. 155-157° C.
MS m/e (%): 579 (M+H+, 100). To a solution of 31.6 g (54.6 mmol)2-(3,5-bis-trifluoromethyl-phenyl)-N-methyl-N-[6-(4-methyl-piperazin-1-yl)-4-o-tolyl-pyridin-3-yl]-isobutyramide in 250 ml diethyl ether were added under ice cooling 60 ml 3 N hydrochloric acid solution in diethyl ether. After stirring for 15 min at 0° C., the suspension was evaporated to dryness, re-suspended in 100 ml diethyl ether, filtered and dried in vacuo to give 34.8 g (98%) of the title compound as white crystals. M.p. 235-238° C.
Other general procedures of preparing similar compounds to intermediate 1 of Scheme 1 are also disclosed in U.S. Pat. Nos. 6,303,790, 6,531,597, 6,297,375 and 6,479,483, the entirety of which are incorporated herein by reference. 13.0 g (82.5 mMol) 6-Chloro-nicotinic acid in 65 ml THF were cooled to 0° C. and 206.3 ml (206.3 mMol) o-tolylmagnesium chloride solution (1M in THF) were added over 45 minutes. The solution obtained was further stirred 3 hours at 0° C. and overnight at room temperature. It was cooled to −60° C. and 103.8 ml (1.8 Mol) acetic acid were added, followed by 35 ml THF and 44.24 g (165 mMol) manganese(III) acetate dihydrate. After 30 minutes at −60° C. and one hour at room temperature, the reaction mixture was filtered and THF removed under reduced pressure. The residue was partitioned between water and dichloromethane and extracted. The crude product was filtered on silica gel (eluent: ethyl acetate/toluene/formic acid 20:75:5) then partitioned between 200 ml aqueous half-saturated sodium carbonate solution and 100 ml dichloromethane. The organic phase was washed with 50 ml aqueous half-saturated sodium carbonate solution, The combined aqueous phases were acidified with 25 ml aqueous HCl 25% and extracted with dichloromethane. The organic extracts were dried (Na2SO4) and concentrated under reduced pressure to yield 10.4 g (51%) of 6-chloro-4-o-tolyl-nicotinic acid as a yellow foam. MS (ISN): 246 (M−H, 100), 202 (M-CO2H, 85), 166 (36). To a solution of 8.0 g (32.3 mMol) 6-chloro-4-o-tolyl-nicotinic acid in 48.0 ml THF were added 3.1 ml (42.0 mMol) thionylchloride and 143 .mu.l (1.8 mMol) DMF. After 2 hours at 50° C., the reaction mixture was cooled to room temperature and added to a solution of 72.5 ml aqueous ammonium hydroxide 25% and 96 ml water cooled to 0″C. After 30 minutes at 0° C., THF was removed under reduced pressure and the aqueous layer was extracted with ethyl acetate. Removal of the solvent yielded 7.8 g (98%) 6-chloro-4-o-tolyl-nicotinamide as a beige crystalline foam. MS (ISP): 247 (M+H30 , 100). 1.0 g (4.05 mMol) 6-Chloro-4-o-tolyl-nicotinamidein 9.0 ml 1-methyl-piperazine was heated to 100° C. for 2 hours. The excess N-methyl-piperazine was removed under high vacuum and the residue was filtered on silica gel (eluent: dichloromethane) to yield 1.2 g (95%) 6-(4-methyl-piperazin-1yl)-4-o-tolyl-nicotinamide as a light yellow crystalline foam. MS (ISP): 311 (M+H+, 100), 254 (62). A solution of 0.2 g (0.6 mMol) 6-(4-methyl-piperazin-1-yl)-4-o-tolyl-nicotinamide in 1.0 ml methanol was added to a solution of 103 mg (2.6 mMol) sodium hydroxide in 1.47 ml (3.2 mMol) NaOCl (13%) and heated for 2 hours at 70° C. After removal of methanol, the aqueous layer was extracted with ethyl acetate. The combined. organic extracts were dried (Na2SO4), concentrated under reduced pressure and the residue filtered on silica gel (eluent: dichloromethane/methanol 4:1) to yield 100 mg (70%) 6-(4-methyl-piperazine-1-yl)-4o-tolyl-pyridin-3-ylamine as a brown resin. MS (ISP): 283 (M+H+, 100), 226 (42). 2.15 ml (11.6 mMol) Sodium methoxide in methanol were added over 30 minutes to a suspension of 0.85 g (4.6 mMol) N-bromosuccinimide in 5.0 ml dichloromethane cooled to −5° C. The reaction mixture was stirred 16 hours at −5° C. Still at this temperature, a solution of 1.0 g (3.1 mMol) 6-(4-methyl-piperazin-1-yl)-4-o-tolyl-nicotinamide in 5.0 ml methanol was added over 20 minutes and stirred for 5 hours. 7.1 ml (7.1 mMol) Aqueous HCl 1N and 20 ml dichloromethane were added. The phases were separated and the organic phase was washed with deionized water. The aqueous phases were extracted with dichloromethane, brought to pH=8 with aqueous NaOH 1N and further extracted with dichloromethane. 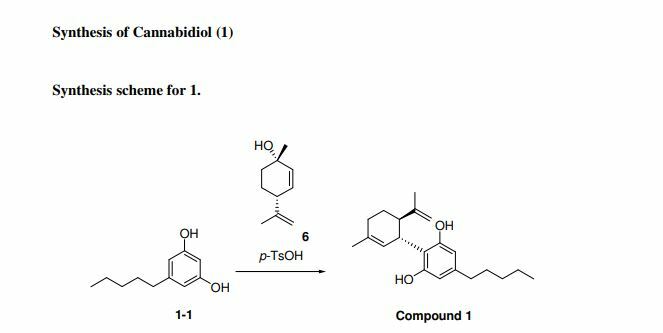 The latter organic, extracts were combined, dried (Na2SO4) and concentrated to yield 1.08 g (quant.) [6-(4-methyl-piperazin-1yl)-4-o-tolyl-pyridin-3-yl]-carbamic acid methyl ester as a grey foam. MS (ISP): 341 (M+H+, 100), 284 (35). A solution of 0.5 g (1.4 mMol) [6-(4-methyl-piperazin-1-yl)-4-o-tolyl-pyridin-3-yl]-carbamic acid methyl ester in 3.0 ml dichloromethane was added over 10 minutes to a solution of 1.98 ml (6.9 mMol) Red-Al.RTM. (70% in toluene) and 2.5 ml toluene (exothermic, cool with a water bath to avoid temperature to go >50° C.). The reaction mixture was stirred 2 hours at 50° C. in CH2Cl2, extracted with ethyl acetate and cooled to 0° C. 4 ml Aqueous NaOH 1N were carefully (exothermic) added over 15 minutes, followed by 20 ml ethyl acetate. The phases were separated and the aqueous phase was extracted with ethyl acetate. The combined organic extracts were washed with deionized water and brine, dried (Na2SO4) and concentrated under reduced pressure to yield 0.37 g (89%) methyl-[6-4-methyl-piperazin-1-yl)-4-o-tolyl-pyridin-3-yl]-amine as an orange resin. MS (ISP): 297 (M+H+, 100). 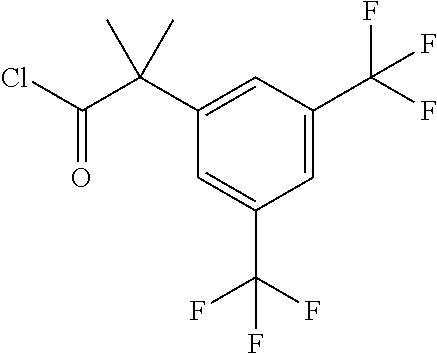 15.0 g (50 mmol) 2-(3,5-bis-trifluoromethyl-phenyl)-2-methyl-propionic acid were dissolved in 127.5 ml dichloromethane in the presence of 0.75 ml DMF. 8.76 ml (2 eq.) Oxalyl chloride were added and after 4.5 hours, the solution was rotary evaporated to dryness. 9 ml Toluene were added and the resulting solution was again rotary evaporated, then dried under high vacuum yielding 16.25 g (quant.) of 2-(3,5-bis-trifluoromethyl-phenyl)-2-methyl-propionyl chloride as a yellow oil of 86% purity according to HPLC analysis. NMR (250 MHz, CDCl3): 7.86 (br s, 1H); 7.77, (br s, 2H, 3 Harom); 1.77 (s, 6H, 2 CH3). A solution of 20 g (67.5 mmol) methyl-[6-(4-methyl-piperazin-1-yl)-4-o-tolyl-pyridin-3-yl]-amine and 17.5 ml (101 mmol) N-ethyldiisopropylamine in 200 ml dichloromethane was cooled in an ice bath and a solution of 24 g (75 mmol)2-(3,5-bis-trifluoromethyl-phenyl)-2-methyl-propionyl chloride in 50 ml dichloromethane was added dropwise. The reaction mixture was warmed to 35-40° C. for 3 h, cooled to room temperature again and was stirred with 250 ml saturated sodium bicarbonate solution. The organic layer was separated and the aqueous phase was extracted with dichloromethane, The combined organic layers were dried (magnesium sulfate) and evaporated. 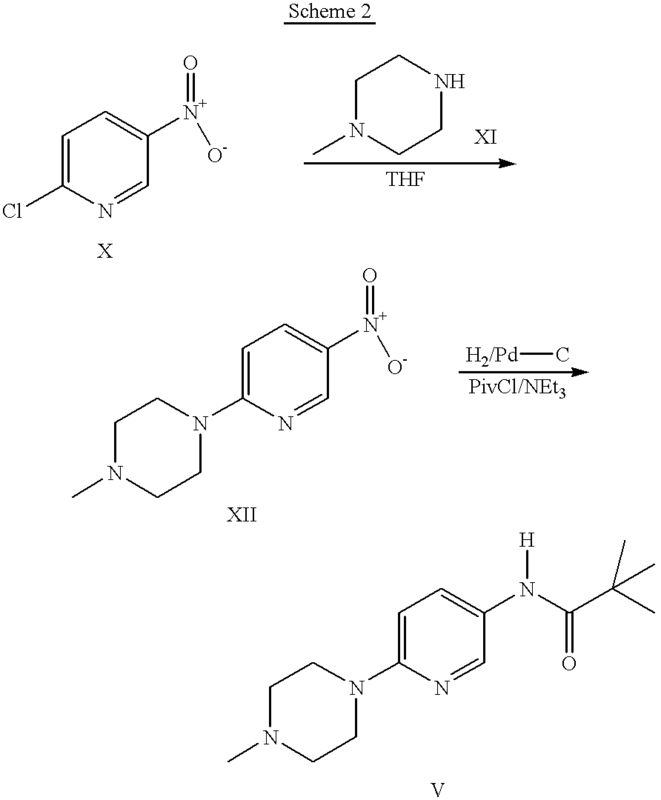 The residue was purified by flash chromatography to give 31.6 g (81%) of 2-(3,5-bis(trifluoromethyl)phenyl)-N,2-dimethyl-N-(6-(4-methylpiperazin-1yl)-4-(o-tolyl)pyridin-3yl)propanamide as white crystals. M.P. 155-157° C.; MS m/e (%): 579 (M+H+, 100). The solution of 6-chloropyridin-3-amine (115 g, 0.898 mol) and (Boc)2O (215.4 g, 0.988 mol) in 900 mL of dioxane was refluxed overnight. The resulting solution was poured into 1500 mL of water. The resulting solid was collected, washed with water and re-crystallized from EtOAc to afford 160 g tert-butyl (6-chloropyridin-3yl)carbamate as a white solid (Yield: 78.2%). To the solution of tert-butyl (6-chloropyridin-3-yl)carbamate (160 g, 0.7 mol) in 1 L of anhydrous THF was added n-BuLi (600 mL, L5 ml) at −78° C. under N2 atmosphere. After the addition was finished, the solution was stirred at −78° C. for 30 min, and the solution of I2 (177.68 g, 0.7 mol) in 800 mL of anhydrous THF was added. Then the solution was stirred at −78° C. for 4 hrs, TLC indicated the reaction was over. Water was added for quench, and EtOAc was added to extract twice. The combined organic phases were washed with brine, dried over Na2SO4, filtered and purified by flash chromatography to afford 80 g of tert-butyl (6-chloro-4-iodopyridin-3-yl)carbamate as a yellow solid (32.3%). To the solution of tert-butyl (6-chloro-4-iodopyridin-3-yl)carbamate (61 g, 0.172 mol) in 300 of anhydrous THF was added 60% NaH (7.6 g, 0.189 mol) at 0° C. under N2 atmosphere. After the addition was finished, the solution was stirred for 30 min, and then the solution of MeI (26.92 g, 0.189 mol) in 100 mL of dry THF was added. Then the solution was stirred at 0° C. for 3 hrs. TLC indicated the reaction was over. Water was added for quench, and EtOAc was added to extract twice. The combined organic phases were washed with brine, dried over Na2SO4, filtered and concentrated to afford 63 g of crude tert-butyl (6-chloro-4-iodopyridin-3-yl)methyl)carbamate used into the following de-protection without the further purification. To the solution of tert-butyl (6-chloro-4-iodopyridin-3-yl)(methyl)carbamate (62.5 g, 0.172 mol) in 500 mL of anhydrous DCM was added 180 mL of TFA. Then the solution was stirred at room temperature for 4 hrs. Concentrated to remove the solvent, and purified by flash chromatography to afford 45.1 g 6-chloro-4-iodo-N-methylpyridin-3-amine as a yellow solid (Yield: 97.3%). To the solution of 6-chloro-4-iodo-N-methylpyridin-3-amine (40.3 g, 0.15 mol) and 2-methylbenzene boric acid (24.5 g, 0.18 mol) in 600 mL of anhydrous toluene was added 400 mL of 2 N aq. Na2CO3 solution, Pd(OAc)2 (3.36 g, 15 mmol) and PPh3(7.87 g, 0.03 mmol), The solution was stirred at 100° C. for 2 hrs. Cooled to room temperature, and diluted with water. EtOAc was added to extract twice. The combined organic phases were washed with water and brine consecutively, dried over Na2SO4, concentrated and purified by flash chromatography to afford 19 g 6-chloro-N-methyl-4-(o-tolyl)pyridin-3-amine as a white solid (Yield: 54.6%). To the solution of 6-chloro-N-methyl-4-(o-tolyl)pyridin-3-amine (18.87 g, 81.3 mmol) and DMAP (29.8 g, 243.9 mmol) in 200 mL of anhydrous toluene was added the solution of 2-(3,5-bis-trifluoromethyl-phenyl)-2-methyl-propionyl chloride (28.5 g, 89.4 mmol) in toluene under N2 atmosphere. The solution was heated at 120° C. for 23 hrs. Cooled to room temperature, poured into 1 L of 5% aq. NaHCO3 solution, and extracted with EtOAc twice. The combined organic phases were washed by water and brine consecutively, dried. over Na2SO4, filtered and purified by flash chromatography to afford 35 g 2-(3,5-bis(trifluoromethyl)phenyl)-N-(6-chloro-4-(4-tolyl)pyridin-3-yl)-N,2-dimethylpropanamide as a white solid (Yield: 83.9%). 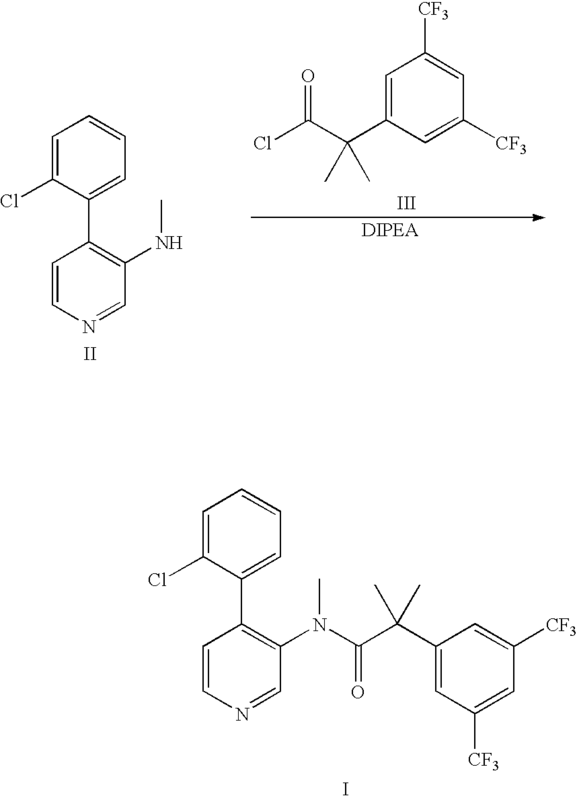 To the solution of 2-(3,5-bis(trifluoromethyl)phenyl)-N-(6-chloro-4-(o-tolyl)pyridin-3-yl)-N,2-dimethylpropanamide (5.14 g, 10 mmol) in 60 mL of DCM was added m-CPBA (6.92 g, 40 mmol) at 0° C. under N2 atmosphere. Then the solution was stirred overnight at room temperature. 1 N aq. NaOH solution was added to wash twice for removing the excess m-CPBA. and a side product. The organic phase was washed by brine, dried over Na2SO4, filtered and concentrated to afford 5.11 g of crude 5-(2-(3,5-bis(trifluoromethyl)phenyl-N,2-dimethylpropanamido)-2-chloro-4(o-tolyl)pyridine 1-oxide as a white solid (Yield: 96.4%). To the solution of crude 5-(2-(3,5-bis(trifluoromethyl)phenyl)-N,2-dimethylpropanamido)-2-chloro-4-(o-tolyl)pyridine 1-oxide (5.1 g, 9.62 mmol) in 80 mL of n-BuOH was added N-methylpiperazine (7.41 g, 74.1 mmol) under N2 atmosphere. Then the solution was stirred at 80° C. overnight. 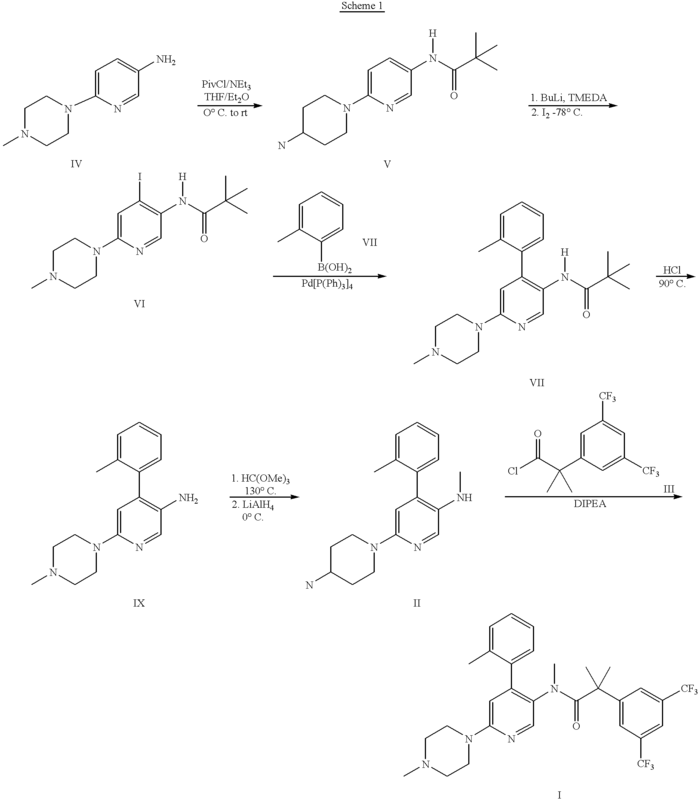 Concentrated and purified by flash chromatography to afford 4.98 g 5-(2-(3,5-bis(trifluoromethyl)phenyl-N,2-dimethylpropanamido)-2-(4-methylpiperazin-1-yl)-4-(o-tolyl)pyridine 1-oxide as a white solid (Yield: 87.2%), 1HNMR (CDCl3, 400 MHz) δ 8.15 (s, 1H), 7.93 (s, 1H), 7.78 (s, 2H), 7.38 (m, 2H), 7.28 (m, 1H), 7.17 (m, 1H), 7.07 (s, 1H), 5.50 (s, 3H), 2.72 (d, J=4.4 Hz, 4H), 2.57 (m, 3H), 2.40 (s, 3H), 2.23 (s, 3H), 1.45-1.20 (m, 6H). MS m/e (%): 223 (M+H+, 100). MS m/e (%): 277 (M+H+, 100). A solution of 30 g (108 mmol) 2,2-dimethyl-N-[6-(4-methyl-piperazin-1-yl)-pyridin-3-yl]-propionamide and 58 ml (380 mmol) N,N,N′,N′-tetramethylethylenediamine under argon in 650 ml tetrahydrofuran was cooled in a dry ice bath to −78° C. Within 1 h, 239 ml (380 mmol) of a 1.6 N n-butyllithium solution in hexane were added dropwise. The reaction mixture was allowed to warm up to −30° C. overnight. After cooling again to −78° C., 43.6 g (170 mmol) iodine dissolved in 60 ml tetrahydrofuran were added dropwise during 15 min. The dry ice bath was replaced by an ice bath and a solution of 90 g (363 mmol) sodium thiosulfate pentahydrate in 250 ml water were added within 10 min when the temperature of the reaction mixture had reached 0° C. Then, 1000 ml diethyl ether were added and the organic layer was separated. The aqueous layer was extracted twice with 500 ml dichloromethane and the combined organic layers were dried (magnesium sulfate) and evaporated. Flash chromatography gave 18.5 g (42%) of the tide compound as a light brown oil which crystallized upon standing at room temperature. A solution of 35 g (124 mmol) 6-(4-methyl-piperazin-1-yl)-4-o-tolyl-pyridin-3-ylamine in 270 ml trimethyl orthoformate and 8 drops trifluoroacetic acid was heated for 3 h at 130° C. The reaction mixture was evaporated and dried in vacuo for 30 min. The residual oil was dissolved in 100 ml tetrahydrofuran and was added dropwise under ice cooling to 9.4 g (248 mmol) lithium aluminum hydride in 300 ml tetrahydrofuran. The reaction mixture was stirred for 1 h at room temperature, cooled to 0° C. again and acidified (pH 1-2) by addition of 28% hydrochloric acid solution. After stirring for 5 min, 28% sodium hydroxide solution was added to reach pH 10. The solution was filtered over celite, evaporated and purified by flash chromatography to give 23.6 g (64%) of the title compound as a light brown oil. MS m/e (%): 297 (M+H+, 100). A solution of 20 g (67.5 mmol) methyl-[6-(4-methyl-piperazin-1-yl)-4-o-tolyl-pyridin-3-yl]amine and 17.5 ml (101 mmol) N-ethyldiisopropylamine in 200 ml dichloromethane was cooled in an ice bath and a solution of 24 g (75 mmol) 2-(3,5-bis-trifluoromethyl-phenyl)-2-methyl-propionyl chloride in 50 ml dichloromethane was added dropwise. The reaction mixture was warmed to 35-40° C. for 3 h, cooled to room temperature again and was stirred with 250 ml saturated sodium bicarbonate solution. The organic layer was separated and the aqueous phase was extracted with dichloromethane. The combined organic layers were dried (magnesium sulfate) and evaporated. The residue was purified by flash chromatography to give 31.6 g (81%) of the title compound as white crystals. M.p. 155-157° C.
To a solution of 31.6 g (54.6 mmol) 2-(3,5-bis-trifluoromethyl-phenyl)-N-methyl-N-[6-(4-methyl-piperazin-1-yl)-4-o-tolyl-pyridin-3-yl]-isobutyramide in 250 ml diethyl ether were added under ice cooling 60 ml 3 N hydrochloric acid solution in diethyl ether. After stirring for 15 min at 0° C., the suspension was evaporated to dryness, re-suspended in 100 ml diethyl ether, filtered and dried in vacuo to give 34.8 g (98%) of the title compound as white crystals. M.p. 235-238° C.
Management of chemotherapy-induced nausea and vomiting : focus on newer agents and new uses for older agents. Drugs. 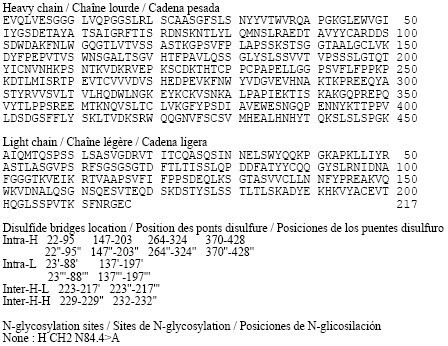 2013 Mar;73(3):249-62. doi: 10.1007/s40265-013-0019-1. Review. 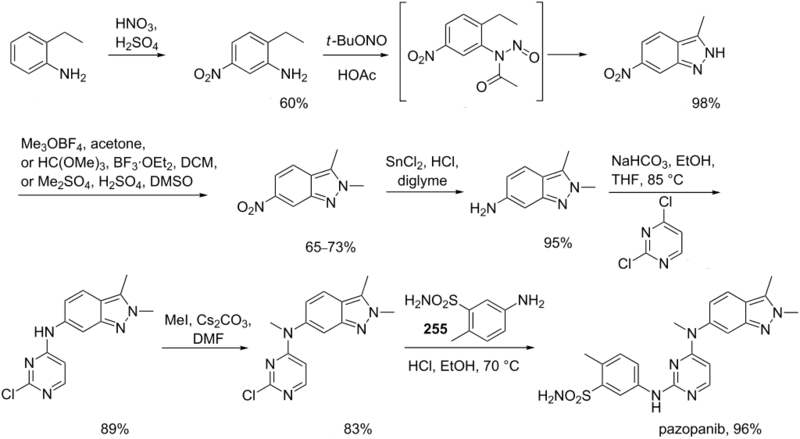 Efficient synthesis of novel NK1 receptor antagonists: selective 1,4-addition of grignard reagents to 6-chloronicotinic acid derivatives. Hoffmann-Emery F, Hilpert H, Scalone M, Waldmeier P.
J Org Chem. 2006 Mar 3;71(5):2000-8. 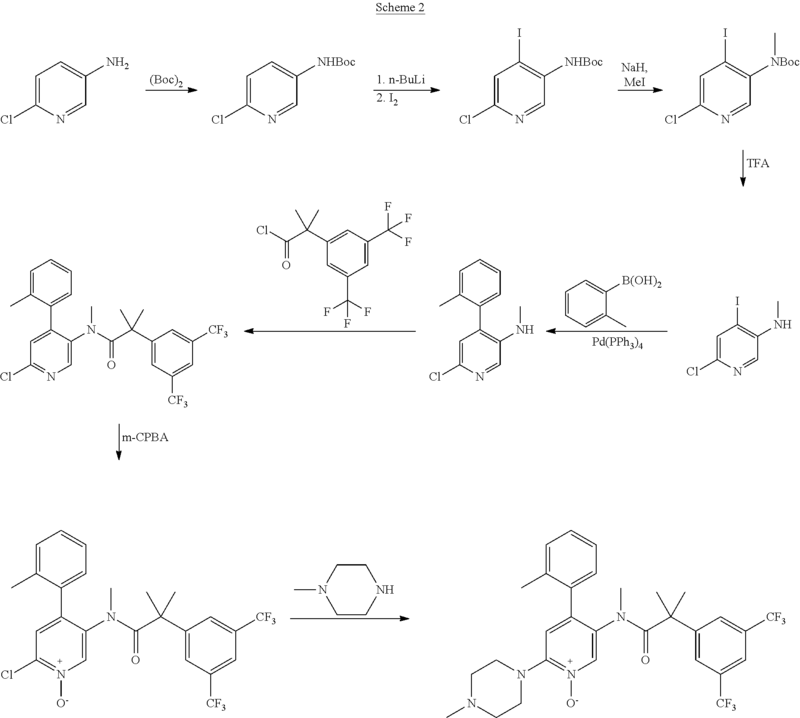 Design and synthesis of a novel, achiral class of highly potent and selective, orally active neurokinin-1 receptor antagonists. Hoffmann T, Bös M, Stadler H, Schnider P, Hunkeler W, Godel T, Galley G, Ballard TM, Higgins GA, Poli SM, Sleight AJ. Bioorg Med Chem Lett. 2006 Mar 1;16(5):1362-5. Epub 2005 Dec 5. By DR ANTHONY MELVIN CRASTO Ph.D in Phase3 drugs, Uncategorized on January 6, 2014 .
a number of decrease in any given time. But is done realize of several guidelines.